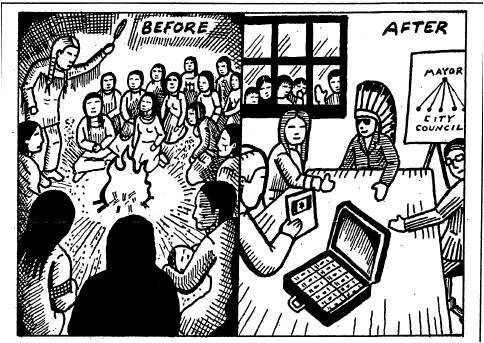 There have always been divisions in our Anishinabek Communities regarding the broken promises that our “Leaders” have accepted with the Crown. In the mid 1700’s Anishinabek Odawa War Chief Pontiac organized an Intertribal campaign to rid Turtle Island of the British as a result of their broken promises. Pontiac’s people agreed to give up arms under the 1764 Niagara Covenant Chain belt which proclaims each Nations right to Sovereignty. This belt since its foundation has been broken many times by the British Crown however our Indigenous Nations who accepted it continue to assert its peace and alliance that it embodies but fails to uphold our own Sovereignty which the belt also represents. Today just as in the 1800’s history seems to be repeating itself. I am one of those youth just as in the past who feel that these lands that we were displaced upon including our Sovereignty is not for sale. “The Coldwater Narrows Experiment was established in the 1830’s by the Lieutenant Governor of Upper Canada, Sir John Colborne, in an attempt to create a self-sustaining farming community for the Chippewas of lakes Huron and Simcoe. Between 1830 and the 1832 the three Chippewa First Nations settled on the reserve. Two of the First Nations under Chief Yellowhead and Snake settled at Coldwater near Lake Huron. The reserve was approximately 10,000 acres in size and ran in a narrow strip of land, approximately 14 miles long by 1.5 miles wide, along an old portage route between Lake Simcoe and Matchedash Bay on Lake Huron. Over the next six years the First Nations constructed a road which ultimately came to be Ontario Highway No.12. The community cleared the land and prospered as farmers. They built schools, houses, barns and mills. The Chippewas of Coldwater Narrows lobbied for six years in an attempt to secure title deeds and self management of their lands. Although they were not successful in obtaining deeds, arrangements were made in 1836 to transfer management of their reserve and ownership of the property. In a Press Conference regarding this Claim held in May 2011 the Government of Canada, the Chippewas of Rama , the Chippewas of Georgina Island , the Beausoleil First Nation and the Chippewas of Nawash announced they have reached a major milestone in talks to resolve the outstanding specific claim in south-central Ontario. Canada has tabled a settlement offer and the four First Nations have agreed to take this offer to their members for a vote. The proposed settlement includes approximately $307 million in financial compensation to resolve the claim. The First Nations also have to right to purchase 10,000 acres on a willing seller, willing buyer basis. The fourth First Nation was added as a beneficiary when Canada researched that a small number of people left Coldwater and amalgamated into the Nawash Band located near Wiarton Ontario. The Coldwater-Narrows specific claim was originally submitted by the CTC on November 4, 1991. After this submission was rejected by Canada, the CTC asked the Indian Claims Commission (ICC)* to hold an inquiry. The ICC has been facilitating discussions between the parties since that time. Subsequently, the CTC revised its allegations, additional historical research was undertaken, and Canada conducted a review of the revised submission and new evidence. Canada accepted the CTC’s claim for negotiation under the Specific Claims Policy on July 23, 2002. Consultants have been working on this for 30 years. 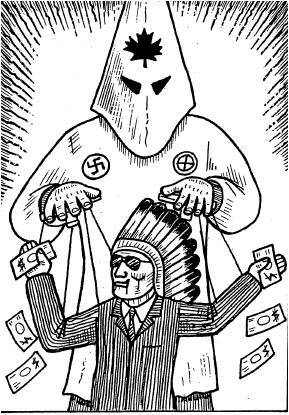 Divide and Conquer has always been a tool used by Colonials who employ greed and power to create divisions. Divisions are always a part of our communities however on this offer we are already seeing divisions. If our communities decide to accept this offer some of the funds from the settlement will rightfully have to go to loans that the First Nations had taken out to pay for consultants and lawyers. In the offer the communities can purchase up to a total of 10,000 acres of land on a willing buyer and willing seller basis. The process of this settlement and its distribution of funds along with adding lands to a reserve will be governed by Canada’s oppressive Indian Act. – The financial compensation that will be distributed will be split up between the four reserves. So the pay out to individual community members from each of the four First Nations will vary in amounts due to each reserve’s population numbers which is creating bitterness amongst the people. – Chief and Council of these First Nations suggest putting aside some funds to benefit future generations. The majority of community members want all the “people’s money” to be distributed and feel they can be responsible themselves for their own future generations share of the funds. There is animosity towards leadership on this is suggestion. – A small minority from these communities reject this offer because they feel the offer does not respect and honor their Nation’s Sovereignty. Their Independence was also taken away along with those lands and retaining their Autonomy has not been addressed in this offer. This minority does not give authority and chooses not to be represented by Indian Act Band Leadership but wishes to represent themselves as Sovereigns and reestablish their right to be an Independent Nation. Utilizing Canadian judicial system and other institutions that are not neutral grounds for a Nation to Nation relationship in this settlement does not exercise their Sovereignty and creates an unbiased outcome. Chief and Council and the majority of people do not hold these people with these views as a legitimate voice for their people and visa versa for this minority. There will always be “Hang- around the Fort Indians” surrendering what little they have just as there will be a small group trying to remain free and retaining their right to be an Autonomous Indigenous People. 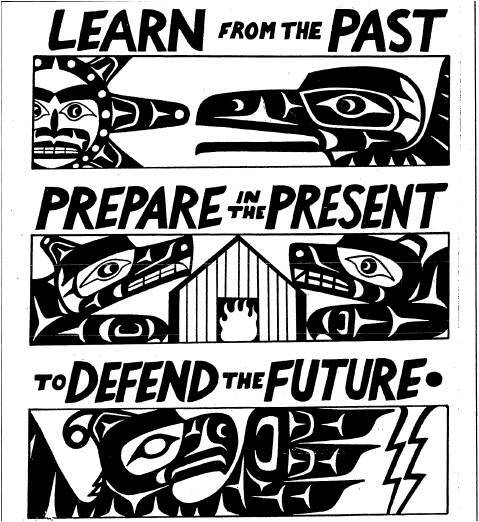 Each group has their right to do as they see fit to be safeguards for their land, rights and future generations. – To be the care takers of the Earth and Waters so that the next Seven Generations coming can enjoy these things given to us by Creator/Creation. – We have a Clan system that we organize under and use for our Governance. – We are our own Sovereign Nation with our own Laws and Customs where we never surrendered. – We say we are all equal, one people and one community. If we accept this offer for financial compensation our future generations most likely will not benefit and we may not see useful lands where we can exercise our hunting, gathering and fishing traditions. We will have surrendered to everything that makes us Anishinabek. Remember in these negotiations we should have negotiated out of the Indian Act since our Independence was taken away when signing those fraudulent documents in the 1800’s. Are we really living up to every thing we preach when we accept this offer? Chiefs who preach on Sovereignty could have lobbied to negotiate on neutral grounds instead of in the Canadian System. We then wouldn’t have expensive lawyer bills to pay. Knowing that Coldwater lands are out of the question to be replaced there is a lot of unoccupied Crown Lands in our old territories which they can transfer over and where we wouldn’t have to purchase back. It’s called negotiating. We say we are environmentalists keeping the future in mind at every ceremony we attend or conduct. Why is it only okay to play “Indian” and dress up on weekends but wrong when a small minority wants to continue the struggle to retain who we are. The struggles are still the same as in AIM’s time and during the OKA crisis. Playing by their rule and utilizing their Courts don’t seem to be assessing injustices correctly. If we accept this offer remember we were all one community at one time. Why is it we continue to embrace the reserve system which will create unfairness when we receive our funds. If we are all equal shouldn’t all beneficiaries get the same amount of compensation? To most tolerance and respect of other people’s beliefs seems to be only “reserved” for those who choose a more complacent conservative colonized way of life. It’s when you start standing up against injustice and rocking the canoe that your beliefs than become intolerable to those who think we are living in Peace and Freedom. Sitting Bull, Crazy Horse, American Indian Movement, Native Youth Movement, Dudley George all were people involved in fighting for our rights and land and the majority of their people had a hard time tolerating what they were doing because of fear of repercussions of the oppressors. OPTIONS You are free to do as you please as it is your right but where is the representation and freedom for those of Sovereign Mind? Option One: Vote yes and surrender the Coldwater Narrows Reserve and any future chance of being recognized as a Sovereign Nation without being governed by the Indian Act. This claim is in our favor to regain our Independence so in voting yes we wouldn’t have a right to bring up this issue in any future litigation. With our compensation we can purchase back stolen land which we were displaced onto in the first place. Option Two: Negotiators working for First Nations are reporting that Prime Minister Stephen Harper’s federal government is moving to cut off specific claims negotiations, a move that one source said could cost First Nations — and at the same time save Canada — billions of dollars, due to the failing capitalist world economy. Several negotiators say they were told that if a First Nation rejects the government’s final offer, the negotiations will be shut down and the only recourse will be to take the claim before the Specific Claims Tribunal. But the tribunal cannot award more than a total of $250 million each year for all the claims it hears. And the legislation phases out the tribunal after 10 years. So if we vote no to renegotiate or further litigate playing by their unfair rules in their system we would loose a chance of seeing this amount of money 308 million. What the government is doing is not negotiating but still holding guns to our head but using divide and conquer and financial terrorism. If we vote no we could very much loose this amount of money and have to settle for less. Option Three: Don’t accept any money and make it known to the Government and Chiefs that you are not accepting any money. Its ok for others to accept the offer but those who want to disband have that right to keep trying to retain those sacred agreements that founded Canada and acknowledges our Nationhood . Organize Option Three in our Sovereign Territory. I also love the images you put in here. They fit so well with what youre trying to say. Im sure youll reach so many people with what youve got to say. option 4. we unite and vote in our own prime minister and use the gov system to further our goals. each reserve nominates one candidate and all agree to get them into the white governmental system. But has to be under one of the existing parties. NDP looking for a new leader so now would be the time. Just a thought. Sigh…. I personally cannot disclose specific information, as i happen to be one of the members involved in this claim. I do agree that why should we purchase land that was stolen from us. Why should any nation do so? There is a clause tho regarding this claim, that I cannot discuss at this time. But I can say I do agree that we need to speak up, and have our voice’s heard. I have spoken up, yet I am ignored, and the lawyers, and chief and council ignore it. If our communities want to be recognized as FN, and thrive in traditions, stop giving ppl the options of “take it or leave it”…..
Well said Johnny. I noticed that someone from a different reserve mentioned the word “experiment” so I googled, “coldwater narrows settlement experiment’. This is at the top of the google search. Thank you for your very informative and factual information. This looks to me like the greatest theft I have seen in my lifetime. A million dollars is not what it used to be. 308 million sounds like a lot. One condo in a big city now goes for a million easy. That means maybe one or two buildings of condos is what is being offered in this trade. One space shuttle launch over the history of the NASA program was on average 1.5 billion: http://en.wikipedia.org/wiki/Space_Shuttle_program. That means that the rights of the people are being sold for one fifth the cost of one space shuttle launch. This is money that the government can imagine and print without any power sharing or genuine interest in the well-being of the people. And what about hunting and fishing? It was said that was given up in the 1836 “agreement” and that doesn’t seem to find mention anywhere. Accepting this agreement would be in the view of a random white man who understands something of how white governments think would be bad. If the roles were reversed European peoples would NEVER accept such a bad deal, unless they had lost their bearings, or had not choice. The lawyers seem to have acted with good intentions but at the end of the day they do not sacrifice or surrender anything. Peace and Power, keep the fire, don’t never stop.